Can you imagine a more intimate setting in which to listen to live music than someone’s living room, or back yard? House concerts are put on by dedicated music lovers who open their homes to musicians and fans for an afternoon or evening of music in comfortable surroundings. I had not run across the term before and thought it to be a regional custom, but it turns out that house concerts have been around for years and are fully defined in Wikipedia. Last weekend, we were privileged to be invited to a house concert held at Mac and Jenny Traynham’s place at the south end of Floyd County. After a long drive on dark country roads, we joined 50 people for a stellar evening performance by the southern Appalachian old-time harmony duo, Beverly Smith and Carl Jones. You can see from the picture above that every seat was filled from the living room all the way back to the kitchen. The attentive audience sat enthralled as Beverly and Carl sang and played guitars, mandolin, banjo, and a fiddle in these intimate surroundings. Their voices blended seamlessly and they swapped instruments for almost every number. 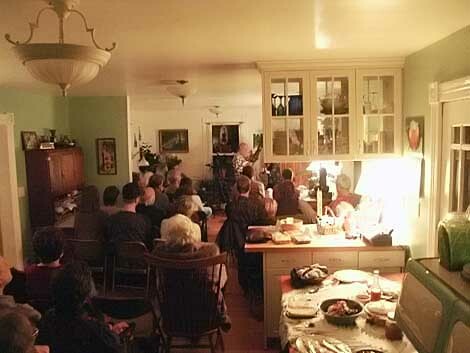 After an hour of music, the concert featured a short break where everyone got to visit and sample the home-made pies, cookies and other desserts that you can see in the lower right corner of the kitchen image. There was a donation bowl which was soon filled to overflowing. As is usual with house concerts, the donations went straight to the performers. 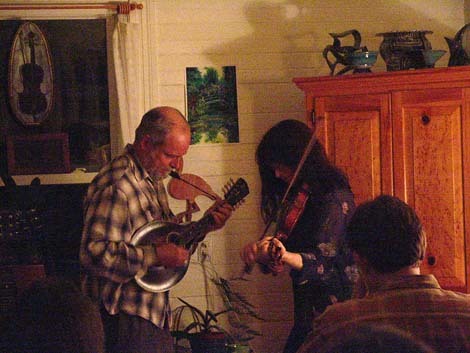 Jenny and Mac Traynham hosted this concert, as they have two before, as a labor of love. During the second half of the evening’s performance, Carl and Beverly invited Mac and Jenny to join them. The quartet played as though they had always played together. As Jenny explained, that was actually the case. They have played together informally whenever they appeared on the same venue. The end result was flawless musicianship and a rousing finale to a very special evening. Mac and Jenny are to be commended for hosting this house concert and I hope they don’t have to wait a year to hold the next one. On the other hand, any one with a large living room and a hospitable nature could probably contact Mac and Jenny for advice and arrange to host a house concert themselves. If you do, please send us an invitation! 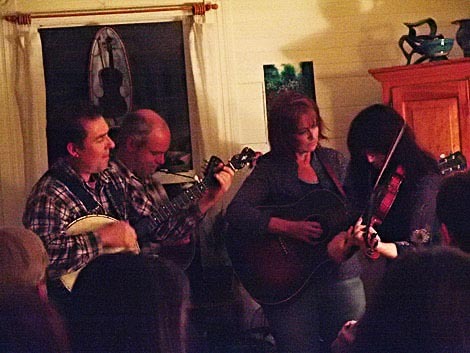 House concerts are fairly common fair here in Fredericksburg. Went to my first one in December which featured Pete Fields and a quartet of classical guitarists doing a Christmas program. You haven’t heard the Charlie Brown Christmas Song until you’ve heard it rendered by four world class clasical guitarists. Just wanted to let you know of a great resource for people interested in house concerts. Hundreds of artists – hundreds of presenters. 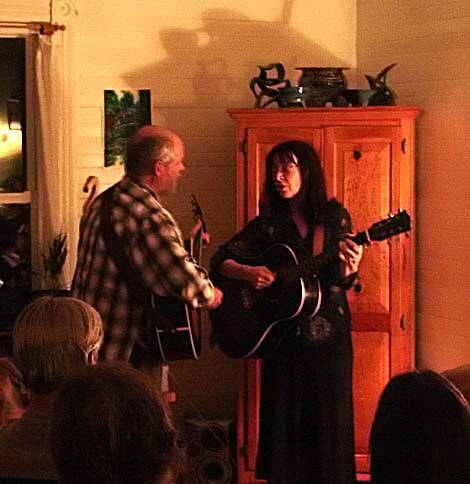 Thanks for the good words about the house concert. Carl and Beverly received your blog and were impressed also. One thing though, Jenny says that she didn’t say what you said she said. (about having played together before) Apparently you misunderstood. as ‘old-time’ music as opposed to bluegrass music. All of us are friends through our common interest in the early country music songs which we like as much for what they represent (a world in which the majority of America was rural and music and dancing were primary forms of recreation) as well as the interesting array of acoustic sounds from natural materials made by hand into instruments taken up and played by an earlier generation. have in our extensive old-time country music collections. The words of some mean more to us than others but we primarily are drawn to a ‘sound’ first so we listen to absorb all the details. in the modern world. That sounds like a mission statement huh? Most of the shows are going to be at people’s houses in Western Australia for some reason. That’s such a cool concept! I guess it’s really not all that novel, though. People have been playing gigs out of houses forever. But still… It’d be cool to have a unified database for OUT-house concerts (as in, sending a band OUT for a gig at someone else’s house). Just a thought.